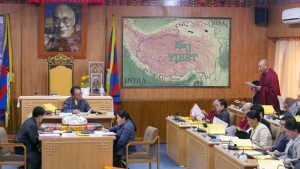 Dharamsala: Chaired by Speaker Mr. Pema Jungney, the second day of the 7th session of the 16th Tibetan Parliament-in-Exile began at 9:30 AM with continuation of Debate on the Official Solidarity resolution on the critical situations inside Tibet from the previous day. Thereafter, the official solidarity resolution passed with simple majority. 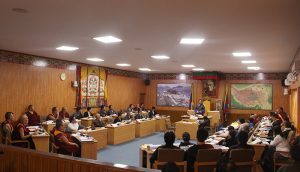 The session continued with debate on the statement of Finance Minister and précis 2019-2020-budget report by the Budget Estimate Committee and clarifications provided against the doubts and questions raised by the concerned parliamentarians on the 2019-2020 CTA budget by Finance Minister and Budget Estimate Committee. 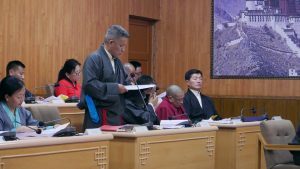 The debate paved way for the fourth list of business for the day with debate and approval on the budget of the various departments and offices under the Central Tibetan Administration for the year 2019-2020, starting from Tibetan Parliamentary Secretariat, Supreme Justice Commissioner, Local Tibetan Assembly, Kashag Secretariat and Department of Security. 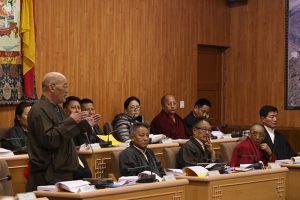 The session then adjourned for lunch break and resumed at 1:30 pm with continued debate on the budget of the Department of Security and its approval. 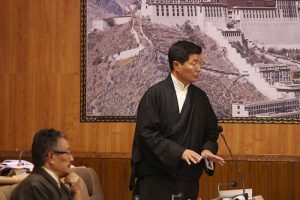 Accordingly, debate on budget of the Department of Information and International continued until the session adjourned at 5 pm. The session will continue from 9:30 am of the next morning.